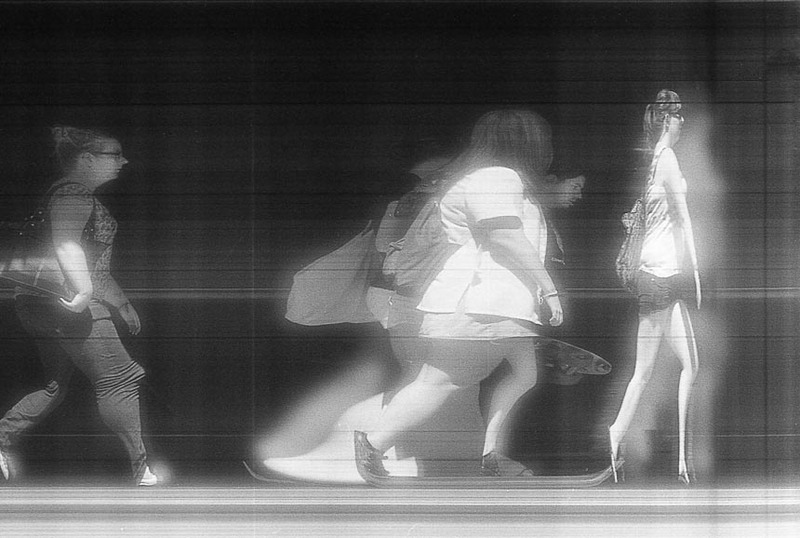 Strip camera images of passing students. A university assignment to capture surreal images. During the photo-finish in a horse race a specialised camera records photographically the “truth” of each horse as it crosses the line on a moving film that is synchronised to the speed of the horses. The camera is recording time in the same image as it records form. This is not the truth as our minds perceive it as we are not capable of separating the confused blur of moving legs, heads and jockeys. This camera is also not recording the same truth as the images of Eadweard Muybridge, or any motion picture since then for that matter, as they are a series of frozen moments separated by finite gaps of time; gaps where something has happened that can never be revealed. Conventional cameras record, in essence, a 2-d representation of a 3-d volume in space comprised of horizontal, vertical and depth axes. The photo-finish camera, or “strip camera”, exchanges time for the horizontal axis, i.e. it records time within a slice of space. These images explore the idea of replacing the horizontal dimension in a scene with time and recording walking people rather than galloping horses. 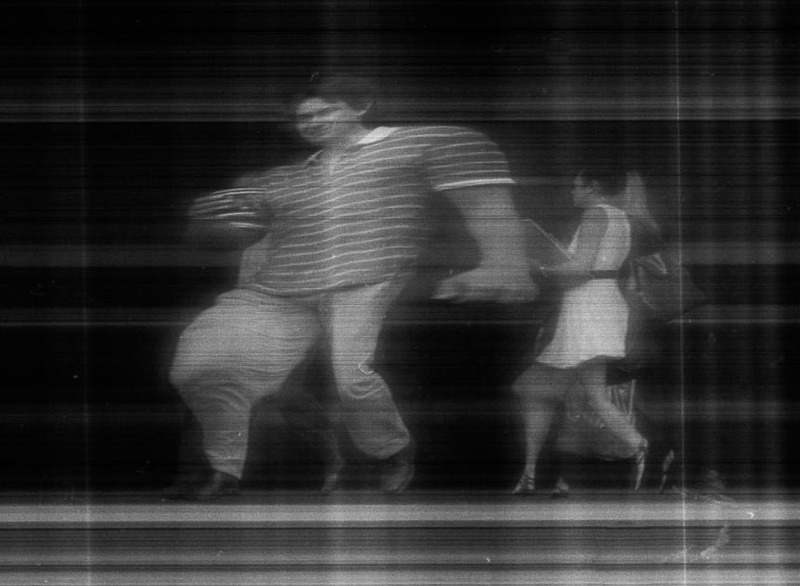 The technique uses an SLR film camera modified by masking all the film at the focal plane with the exception of a narrow vertical slit at the centre of the frame. With the shutter held open the film is rewound past the slit thus continuously recording an image as subjects move in front of the lens. A hand-crank is added to the film winder for smoother control of the rewinding film. 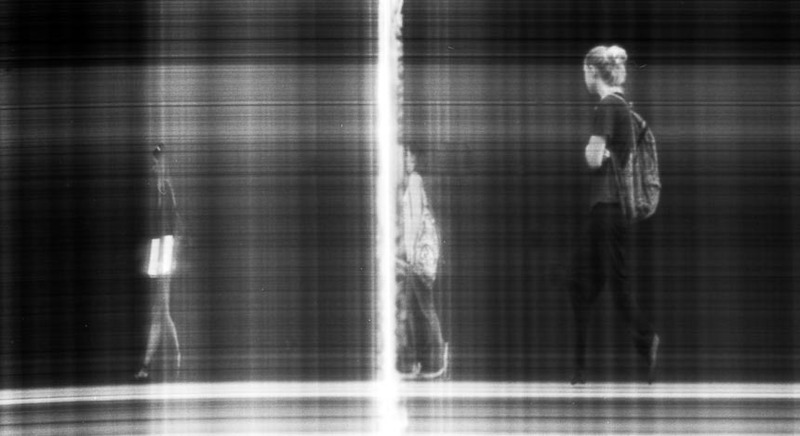 Details of how this can be done – a site I discovered after I finished the assignment – can be found at Basics of Strip Photography by Andrew Davidhazy. 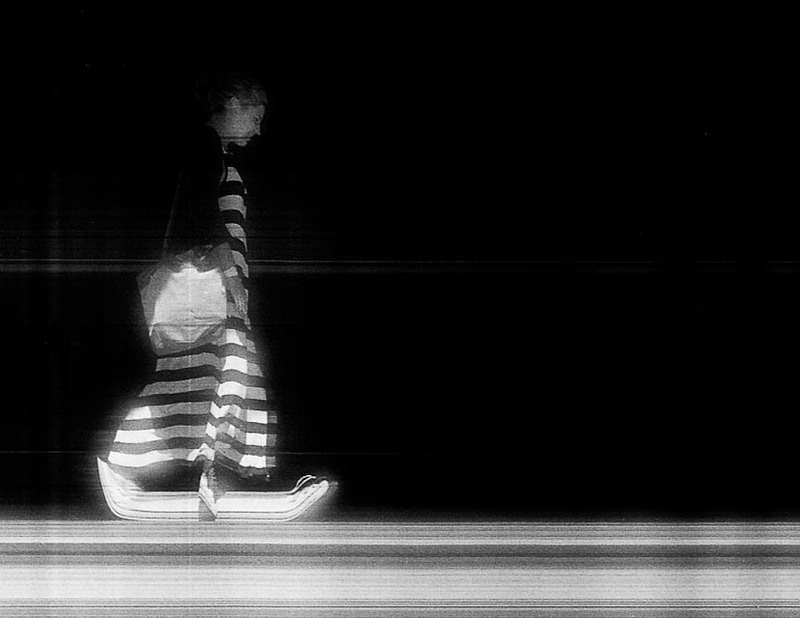 This crude approach produces surprisingly good results that have their own aesthetic: dark horizontal lines cut through moving subjects as a result of the rough edges of the hand cut slit; glowing apparitions arise from internal reflections between the mask and the film; and distortions of subject arise due to their apparent motion and variations in exposure caused by the uneven hand winding. 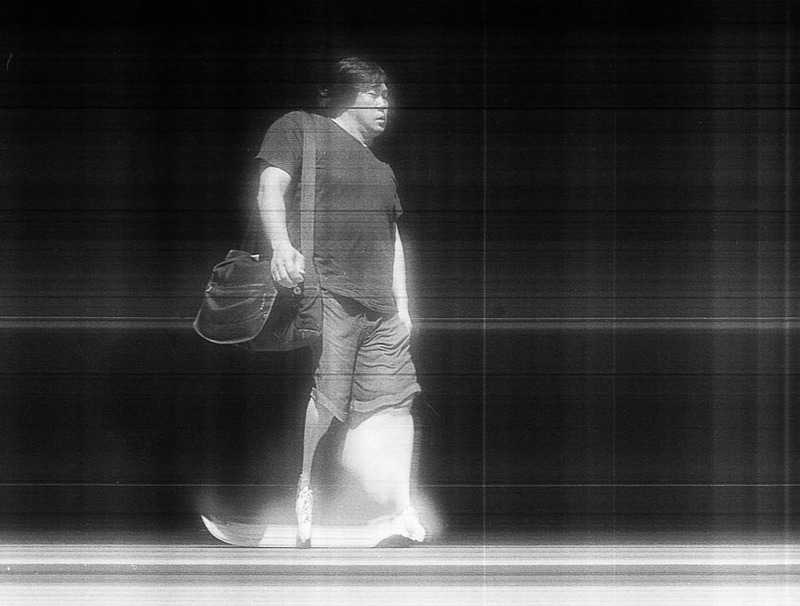 Other artists using strip cameras, or the digital equivalent, are: Adam Magyar, Daniel Crooks, Martin Liebscher and Jay Mark Johnson. And for something really different take a look at Metamorphose by Frederic Fontenoy (pretty sure this is strip photography). If the camera is used to record a rotating subject then peripheral portraits are created.